Starting once a game enters the 10th inning, each team’s lineup will start at the top with the one, two, and three hitters set to lead off the 10th inning for each team and continue the lineup from there. The lineup will not continue where it ended in the 9th. Treat the 10th inning like it’s the first inning. The main point of my proposal for this rule is for discussion. I am not saying I would 100% advocate it or that I believe there needs to be a change to the game, I am just saying it is more realistic of a rule change than others I have seen and is at least worthy of discussion. The biggest change from the addition of this rule would be the best players giving their team the chance to win the game in the 10th, rather than the 11th/12th as the bullpens continue to get more and more taxed. The strongest comparison I have to my “Fresh Start” rule would be hockey’s shootout. Once a hockey game remains tied after overtime they enter into a sudden-death like mode called a shootout. In a shootout, three skaters on each team take alternating shots against the opposing goaltender. If the shootout is tied after three shots per team, “sudden-death” shots will be taken to determine the winner. So, how exactly is this like my “Fresh Start rule?” The matter of choice. Hockey teams get to choose exactly which shooters they want to compete in the shootout. They don’t get stuck with the last guys out on the ice when overtime ends. They select their best three shooters in the best order they can to maximize their chance of winning. In other words, hockey team’s select their 1-2-3 hitters, or their heart of the order. This proposed rule would allow the best players to get a chance to get up when it matters most. It gives the best players the first chance at winning the game, and adds extra excitement to the overtime rules. Every single team would rather have their best players up. It also adds something special to the 10th inning that gives it a sense of excitement. Fans know that almost every batter up that inning can end the game in one swing and it puts you on the edge of your seats from both sides for the entire inning. Whether Judge hits a walk-off or the closer strikeouts out the side it will be very impressive and very intense. Not to mention it provides a little bit more of a chance for MLB to market their stars. If Mike Trout is constantly coming up in the 10th with the game on the line and constantly succeeding, people will take notice and it will be a lot better for Major League Baseball. The “Fresh Start” would add a new element of strategy to the already decision-driven game of baseball. The biggest change would be more of an importance to the Closer position, which might add a justifiable reason for them to get paid what they do. The change proposes an important decision for managers to make with their closers. Would they rather have their closer enter the game in the 9th inning against the 6-7-8 hitters or wait until the 10th inning and have him come in against the 1-2-3 hitters? A team’s closer should be their best reliever, their high leverage guy. You would certainly want him facing the best hitters in the lineup because he has the best chance to get them out. But, what if a manager is saving his closer for the 10th, similar to the Zach Zack Britton situation from the 2016 Wild Card, and his team ends up losing the game in the 9th inning? This situation provides a whole new high leverage element and a new bullpen management situation. For teams with dominant bullpens, like the Yankees, this situation won’t be a big deal but for the average MLB team and team’s with weaker bullpens, this becomes a very important analytical decision that now needs to be made. The “Fresh Start” rule has the potential to speed up the game. The biggest progressive movement and the topic of majority rule discussions is speeding up the pace of play. The “Fresh Start” rule has the potential to speed up the pace of play of extra-inning games while not changing the fundamental rules of baseball or affecting the first nine innings. The chart below breaks down the average runs scored in each inning of a game for 2018. Notice the most runs are scored in the first inning. And what is the one thing guaranteed in the first inning that is not guaranteed in any other inning? The 1-2-3 hitters will get up in that inning. They will be the first three hitters to start the inning. Just like as stated in the proposal, we will treat the 10th inning exactly like the 1st inning. 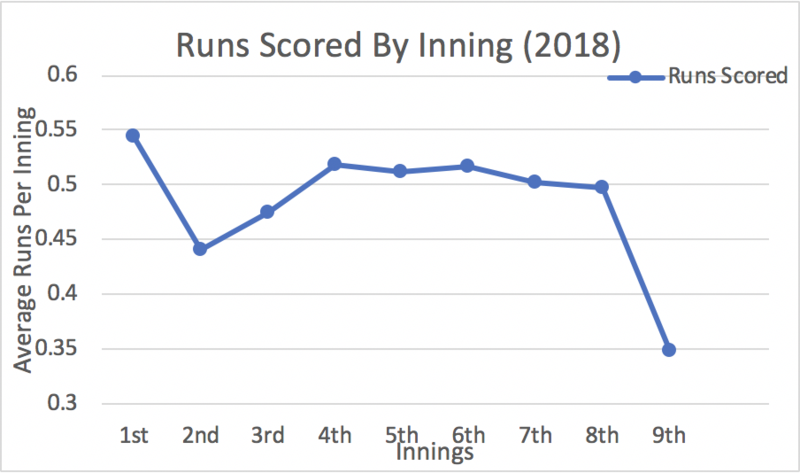 Looking at the data from the chart above, there were approximately 0.54 runs scored in the first inning on average, which is almost identical to the average run expectancy in the MLB ­­–– 0.55. The second highest occurred in the 4th inning, another inning where some, if not all, of the 1-4 hitters are projected to get up. In the 4th and 5th innings there were 0.52 and 0.51 runs scored. Given the 0.54 average runs scored, over a 162-game season, the average team would score approximately 88 first inning runs. Now if the 1-2-3 hitters were guaranteed to get up in the 10th inning, like the 1st, you would assume there would be a much larger chance that the average team would bring home a run in the 10th inning. 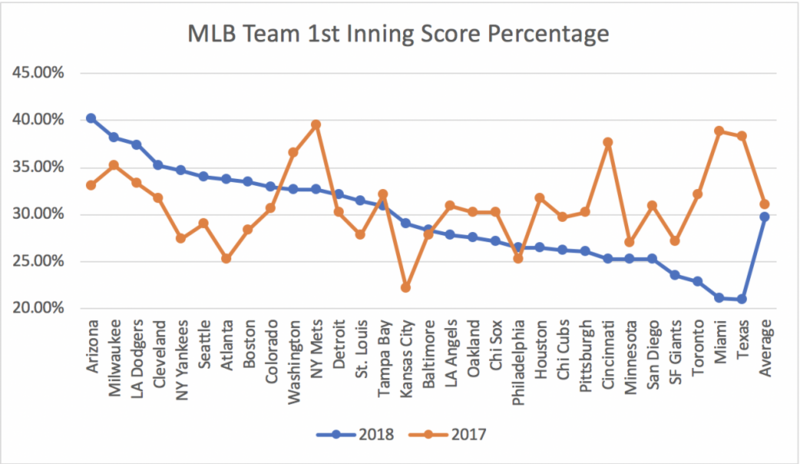 The chart below shows the average 1st inning score percentages from teams for 2018 and 2017 along with the MLB average. So, based on this data, assuming we’re treating the 10th inning like the 1st inning there is on average about a 30% chance that a team would score at least one run in the 10th inning, and most likely end the game after 10. Clearly every extra-inning game won’t end after the 10th inning with this new rule but there is expected to be a sharp increase. After the 10th inning, the data would return back to normal because there is no guarantee that certain hitters would come up in a specific innings again. A study by RetroSheet found that from 1909-2013, the average runs per inning was higher in the 1st inning than every other inning, similar to my data, but also found that the greatest percentage of runs scored occurs from the home team in the 1st inning. If we assume that the 10th inning is going to mimic the 1st inning data under the new rule, then there is an increased chance for a walk-off to occur in the 10th inning. 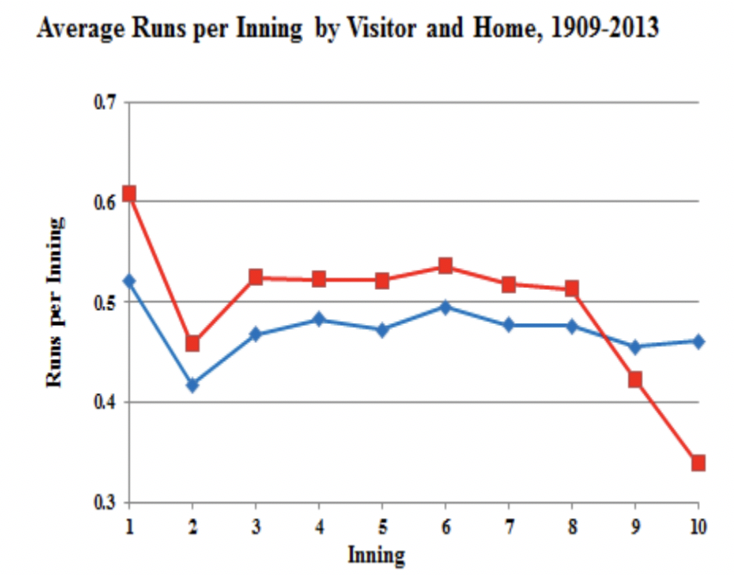 The study also found that there is a 0.15 run difference between the home and away team with a 0.088 difference of runs scored in the first inning. If we calculate the probability of the event that a run will be scored in the 10th inning and that it will be scored by the home team there is about a 39% chance that the event will occur. Roughly about that 8.8% difference in runs scored in the 1st. Based on BaseballReference’s Play Index data, there were a total of 1,416 extra-inning games from 2012-2018. The 1416 extra-inning games total 4% of all regular season games from 2012-2018. 1,348 of those 1,416 ended after 14 innings max. 624 of those games ended after 10 innings, about 43%. If you take the data from all the extra-inning games since 1920, about 44% of extra-inning games end after 10 innings. With the “Fresh Start” rule change, assume that there is a 30% chance a run will be scored in the 10th inning which would cause 30% of those games that end in the 11th inning or later to now end in the 10th inning. There are 792 games that ended in the 11th inning or later. If you assume that 238 of those would now end in the 10th inning, 862 games out of 1,416 are now ended after the 10th,or 60%. That is a 17% increase from the original 43%. It is also a decrease in games ending after the 11th from 57% to 40%. The splits drastically shift from 60-40 to 40-60 just from one little tweak. Now, how does that affect game time? Take a look at the chart below which shows the average time of baseball games from 2012-2018 for the inning in which the game ends. 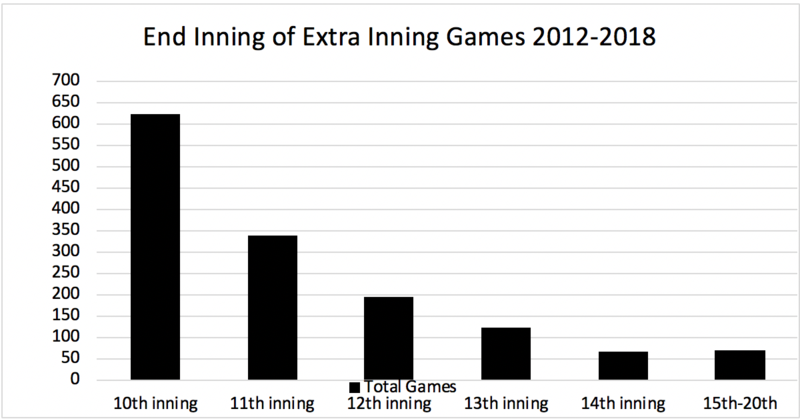 On average, each extra inning of play adds roughly 20 minutes of time. The “Fresh Start” rule won’t eliminate games from going 13 innings instead of 12, or 18 innings instead of 15, but it is meant to severely increase the odds of a game ending after 10 innings. The “Fresh Start Rule” won’t shorten the overall length of games either, obviously, only extra-inning games. That’s not the point. If shortening the length of games is that big of a priority then shorten commercial breaks significantly, not just by 5 seconds. Shorten them to about one minute, or even 30-45 seconds. Increase ads and sponsorships wherever possible during the game, in the stadium, on the TV screen wherever possible. Have the pitcher warm up with two outs in his team’s inning so once the inning ends we can jump right into the next inning in 30 seconds. That’ll cut off 10 minutes alone, 20 minutes if you shorten it to 30, but this is a whole different issue and I’m getting way off track. ANYWAY. Currently, there is about the same chance of a game ending after 10 innings as there is a game ending between the 11th and 13th inning. There is a 46% chance that 20 minutes to an hour is added to a game that heads into extras. If 20% of the 11-14 inning games are now shortened to ten innings. 16% of those games shave off between 40 minutes to an hour and roughly 84% of those games shave off between 20 and 40 minutes of time. Overall 20% of extra-inning games are now between 20 minutes to an hour shorter. While 20 minutes may not seem like much, but if you shaved off 20 minutes off of a regular 9 inning game you would hit an MLB average game time that hasn’t been seen since 1990. Now, while this only affects about 10% of games per year the excitement of seeing the stars from your team get up along with a strong chance that a fan will only have to stay for 20 more minutes should keep a bunch more fans in their seat for another inning opposed to the ones who duck out after nine. I don’t know why this happens, I’ve seen it during the first game of the year and I’ve seen it during September, but once a game hits the 10th inning there’s bound to be fans that head for the parking lot. And, for each inning that comes next more and more fans head to parking lot each inning. I never understood investing three hours into a game then not seeing who wins. I don’t know how many people leave football, basketball or hockey games when they hit overtime, but I guarantee its less. I think the stigma of knowing a game is past its duration but not knowing when it will end causes fans to leave. Fans think they’ll be there for another two hours when in reality it’s at most an hour. With games in the other pro sports, fans know exactly how long they will be staying for this extra time and that inclines them to stay more. I think the biggest improvement will be having casual fans stay longer. If fans knew there was an increased chance the game would end only 20 minutes later they’d be more inclined to stay. Another positive impact of games ending after 10 innings is the effect on umpires. Currently, umpires do not get compensated for extra innings. If an ump is not getting paid, there is a good chance he won’t put in his best effort at his job and will just want to get out of there as fast as possible. According to a study by “FiveThirtyEight,” teams that are in a position to win get up to a 27-percentage point increase in the rate of called balls, while teams that look like they’re about to lose get up to 33 percent more strikes called. It only gets worse as the game goes on. In both of these instances the now unpaid umpire is more likely to use whatever gets the game over with the quickest. Under this new rule if there was an addition that umpires get compensated for the 10th inning as well as the first 9, the game would be called similar to the first 9, and with an increase chance in the game ending after 10, there would be less uncompensated innings for umpires. If an extra inning rule HAS TO BE IMPLEMENTED into major league baseball, I will advocate for my “Fresh Start Rule” any day over the “Schiller Rule” (starting with a runner on 2nd). Hell, I’d even advocate starting with a 2-1 count before I’d advocate for the “Schiller Rule.” And honestly, if the MLB wanted to get really crazy and REALLY speed up the game I’d advocate resetting the lineup every inning for extra innings over the “Schiller Rule.” Hell, the furthest extent I’d go before taking the “Schiller Rule” would be the manager choosing whatever hitter he wanted to send up at any time in extras. My biggest problem with the “Schiller Rule,” besides ruining the integrity of the game with its softball-like aspect, is there will be a GINROMOUS increase in games ending with sacrifice bunts followed by sacrifice flies. It’s logically probable when there’s a runner on second with no outs to advance him to third to create a 0.865 run expectancy and only require a fly ball to win the game. Even throw in the possibility of the intentional walk to set up the double play. Follow that by a sac-bunt and now there’s 2nd and 3rd, one out, and a 1.352 run expectancy. Now be honest, how would you rather have a game end, with the 8-hitter bunting and some pinch hitter hitting a fly ball, or with Aaron Judge up hitting a 400-foot home run? This isn’t really pertinent to my analysis, but I just cannot stress how awful the “Schiller Rule” is in comparison to my “Fresh Start Rule” and if forced to choose one of the two I believe 11/10 people would choose my rule. Is my proposal drastically going to change the game? Definitely not. Is my proposal going to shorten game lengths to where Manfred wants them to be? Nope. Is my proposal going to even be effective? Not sure. Is implementing it even worth it? Again, I have no clue. So, what exactly was the point of all of this? That would be for discussion. My point is that there are plenty of good rule proposals out there that get crowded by whatever terrible ideas Rob Manfred has come up with lately and a lot of solid analytical reasoning behind them. I think it’s great for young minds like myself to look at the game and at least open a discussion on ways to improve it or make it better without touching the fundamental core and tradition that is baseball. Excitement, time-shortening, new strategy elements, what’s not to love? I do know one thing, the “Fresh Start Rule” is 1000% times better than the “Schiller Rule.” But honestly, who doesn’t love free baseball. I’d take 18 inning games any day. Let me know what you think of my idea. Like I said I want to encourage discussion for topics that can be seen from both sides. I appreciate any feedback and whatever potential rule ideas people have for me and would be more than open to any discussions.